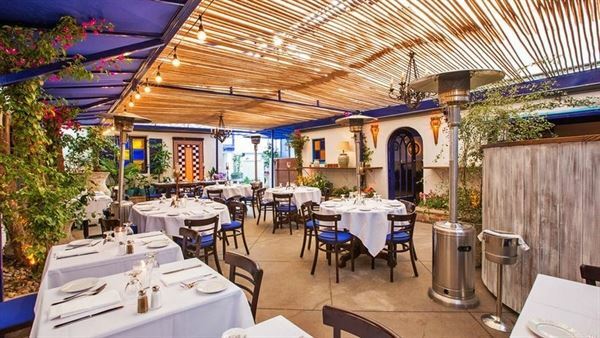 We offer diverse settings of four dining areas for private parties: the Garden Patio, Winter Garden, Piano Room and Blue Room; European country style outdoor space to an intimate room with a fireplace and deep passionate colors of tinted windows. The ambiance of The Little Door is created by your presence. We just provide the right setting, food and drinks tailored to feed your soul. Rent our Piano Room, Winter Garden, Blue Room, or do a full restaurant buyout with a $20,000 minimum F&B. Restaurant can accommodate up to 100 seated guests for daytime events. Rent the Piano Room or the Winter Garden for your daytime event! Rent our Piano Room, Winter Garden, Blue Room, or do a full restaurant buyout with a $15,000 minimum F&B.